The first three characters of your new post code (your Eircode) is called the routing key. This is an area code that identifies which part of the country you live in. Eircode has not published the list of routing keys yet or stated if it ever will. So I’ve put together a quick list of Irish towns with their routing keys for your future reference. Eircode says there are 139 routing keys. I count 34 in Dublin so that leaves 105 for the rest of the country. That means each county gets an average of just 4 routing keys. So the areas are too large to be very useful for narrowing down a location. The routing keys have been chosen to match An Post’s existing distribution system. Some routing keys cross county boundaries. I would be very grateful if you could let me know of any codes I am missing or of any mistakes I may have made in compiling this list. Just leave a comment at the end. Well done with compiling the list! 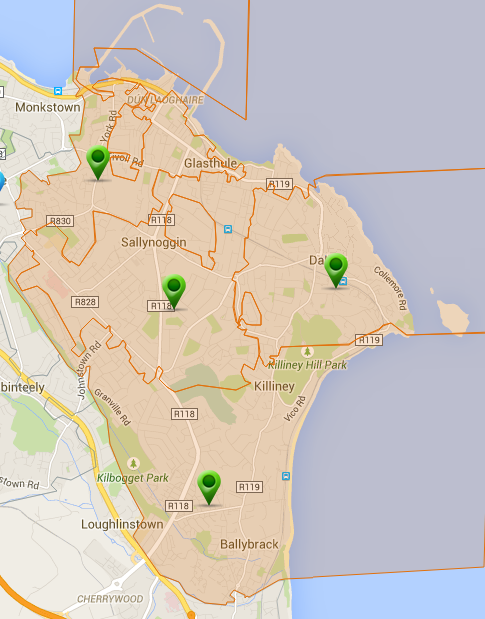 One suggestion – T12 seems to cover Cork city centre as well as Mahon. Congrats on starting this. I don’t know why Eircode don’t just publish a map as one can be deduced through trial and error. Thanks Deryck, Andrew and John. Changes made. 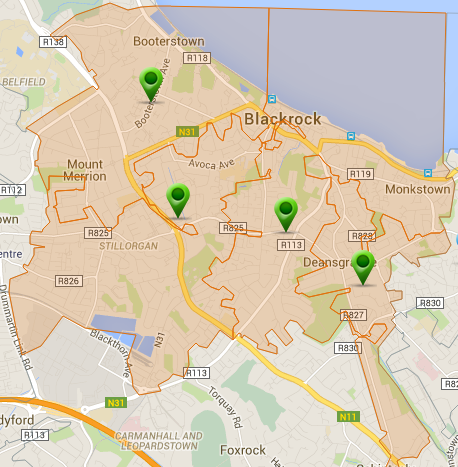 I notice that the Dublin postcode doesn’t always match the routing key. For example, Loughlinstown Hospital (St Columcille’s) has been assigned eircode D18 E365, yet its address is Co Dublin. The basic data linking eircodes with map co-ordinates should be freely available – as they are in the UK. I did up some maps of the boundaries of the routing key areas near my home. This was easy when it turned out that each of these areas comprises a number of An Post publicity post districts. I checked a large sample of eircodes along the borders before trusting these maps. 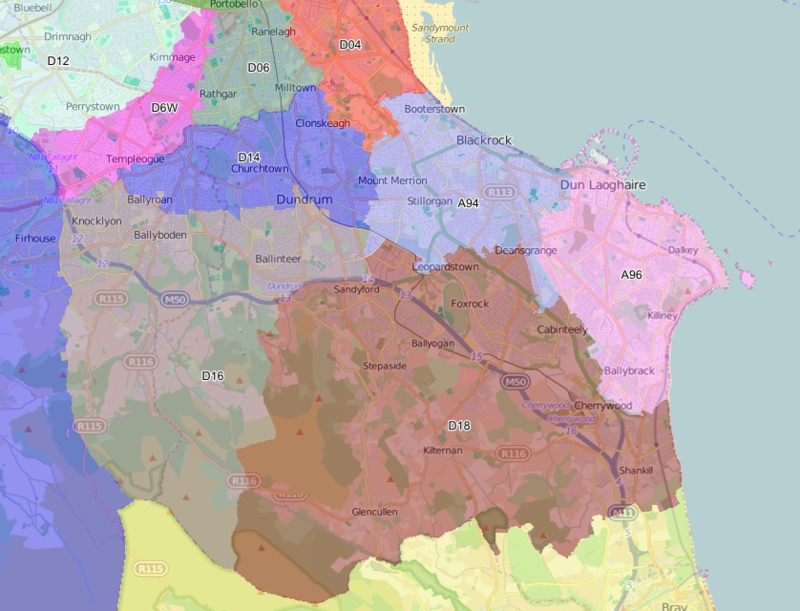 It would be nice to turn these boundary maps into vectors and upload them to OpenStreetMap. The “V94” Routing Key area is huge: It includes Abbeyfeale and then a swathe through West Limerick, the southern shore of the estuary, the city, North-East Limerick, North West Tipperary, the eastern third of Clare and a small bit of South-East Galway near the R352 regional road. It must be the most popukous and probably one of the largest by area. However, Newcastle West, which lies between the “V94” towns of Abbeyfeale and Rathkeale has its own designation: “V42” as has Kilmallock and most of South-East Limerick: “V35”. Searching for Routing Keys for the Irish Cities in ‘EBT’ I have collected a few Routing Keys. They are all in a spreadsheet. 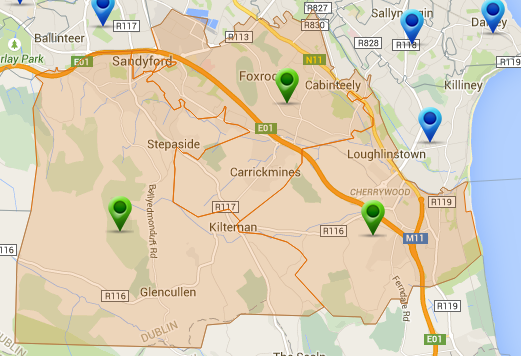 I’m now filling the eircode.codes map, but this is going one by one. Is there a faster way to enter the routing keys on the map? Add Dunleer to A92 plz. What’s the drill for submitting additions? I see the edit option, but backed off lest I make a mess of it. R35 for Walsh Island, Co. Offaly. Thanks Paul, I’ve added it in now. The is also a Crookstown in R14 near Athy, Co. Kildare as well as the one listed above in P14, Co Cork. P14 & R14, P32 & R32, P51 & R51, P56 & R56 ??? Do you reckon this near duplication of easily mistaken letter/number combinations was down to some numpty not thinking? E41 goes out to Mullinahone, too. Hi, it looks like googlemaps have all the Eircodes loaded now. Who deleted all the Eircodes on the map and can we get them back from somewhere? I live near Listowe Co Kerry Code Area V31. Kerry Co Co Water Division are looking for the Eircode for all households i our Water Group Scheme, but I can get only 15 a day from the autu Eircode finder. Is there any place that I cn get a listing, I need about 150. If you search for them in your browser using ‘incognito mode’ you can restart your browser every 15 searches and you will get another 15. A big HOWDY from Texas (Corsicana 50 miles south of Dallas) ! Am a retired public schoolteacher and have followed your Eircode postal development for a few years. To your knowledge, has anyone (or a government agency) placed an estimated population figure for each Routing Key area in your wonderful country ? Any information or assistance shall be most sincerely appreciated. As do many of my USA country men and women, I watch on my VCR or DVD the movie “The Quiet Man” (1952, John Wayne & Maureen O’Hara) annually every March – during the Saint Patricks Day Celebration. When I get a chance, I ‘ll query the Eircode database to get you an answer. I believe that there will be a large variation around the average. As for “The Quiet Man”, that’s a classic film. The old cottage is in ruins but there are plans to restore it. The nearest farm house is at H91 FX03, which is on the Galway side of the Galway/Mayo border. Thanks for your reply (over there…from across the pond). I think I’ve found a way to acquire the estimated population of each Routing Key…HOWEVER…it is quite laborious, most likely inaccurate and very time consuming. I’ll enlarger each Routing Key map and with a straight edge ruler I slowly scan each map vertically or horizontally…and then list every village and town on paper. I then go to my computer’s search engine to seek the most current population for each listed Routing Key population locale. Occasionally I’ll have difficulty obtaining small villages with non-listed populations (thus, the inaccuracy factor). P31…Ballincollig; Old Quarter; Srelane; Deelish; Classis; Farran; Aheria; Begley’s Forge; Tineel; Coolmakee; Carrignaveen; Coolatubrid; Carrignaveen; Coolatubrid; Kilcrea Hill; Knocknatrinane; Garryhesta; Scart; Ovens. So far it’s been an interesting adventure. Would sure be interesting to one day see an official government Census Bureau result of any or all of my inaccuracies. Thanks again your interest and/or any Routing Key assistance rendered. If you’ll send your snail mail address I would like to send you a big road map of the State of Texas. Appreciate the google maps link. Are anpost using the eircodes yet? Eircodes are used by An Post in their automatic sorting machines. Manual sorting does not use eircodes because eircode usage is so low (<5% of letters have eircodes). Even amongst government agencies, Eircode use is still very patchy. For example, new driver licences do not include Eircodes in their addresses even where applicants specifically include them. my Eircode does not match. it refers to a bungalow opposite my house . Has anyone managed to get their hands on an interactive map to show all Eircode yet? If you want to find the address pointed to by an individual eircode, you can just search for it in Google maps. If you use the ECAD database, you can map from individual Eircodes to townlands, villages towns etc.